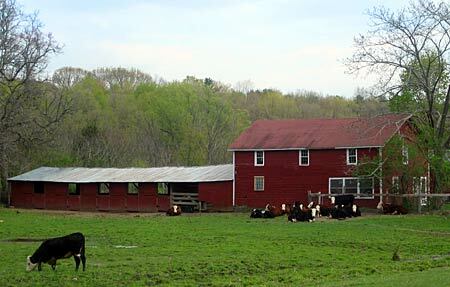 View of the newly protected McKeon Farms property. One of the largest farms ever conserved by Scenic Hudson, these rolling pasture and hay fields support family-owned beef cattle and equine boarding/training operations as well as an orchard. More than 50 percent of the land’s soils are designated USDA Prime or of Statewide Significance. By clearing considerable overgrowth, the owners have restored many acres to active use. The property also contains large forested areas, significant wetlands and 2,000 feet of frontage on the Lakes Kill, an important trout-fishing stream. Our purchase of a conservation easement on the property continues our support of Red Hook’s agriculture-based economy and efforts to preserve its rural character. Since initiating protection of the town’s working, taxpaying farms in 1998—when we conserved 1,000 acres on seven farms—more than 1,200 additional acres have been saved with the help of town and county governments, the Dutchess Land Conservancy and the Winnakee Land Trust. This acquisition creates a contiguous block of protected farmland spanning 1,045 acres. The purchase is part of Scenic Hudson’s collaborative campaign to Save the Land That Matters Most, protecting 65,000 acres of great scenic, ecological and agricultural significance.